Some of you probably remember the Retroville set published long ago by The Mod Squad (of which I was a member). 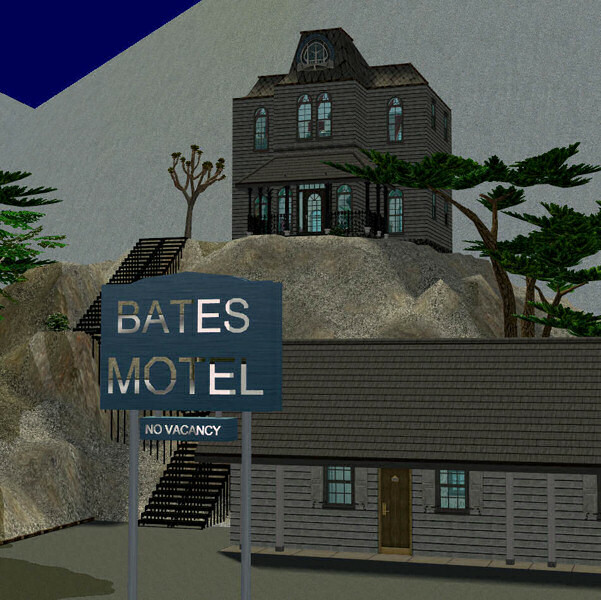 That set contained an impressive Bates Motel, that I loved since it was first published. But it was a normal community lot, so I decided to make a Bon Voyage "hotel" version from it, usable as lodging location during vacations. The lot has 5 bedrooms near the lower parking, and a 2-storey building uphill, where you can find some shopping facilities (ground floor) and a living room (upstairs). 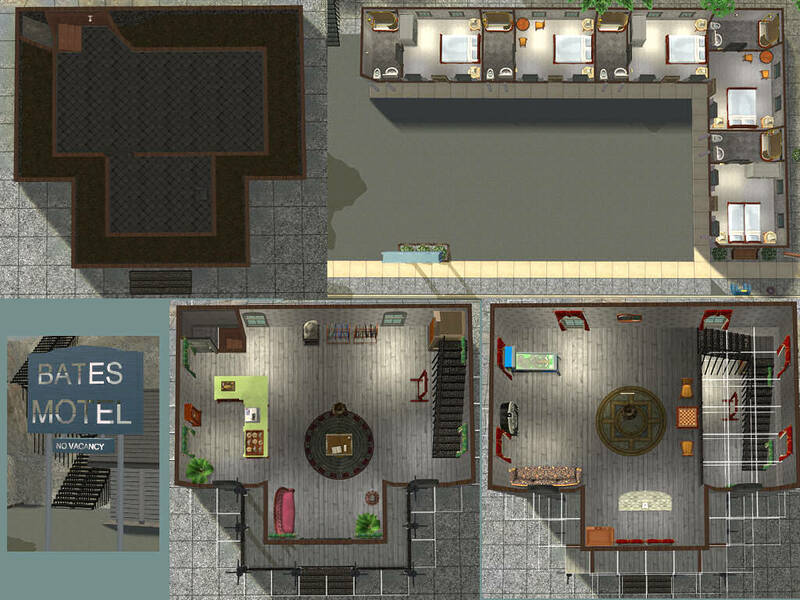 Bedrooms were transformed in hotel rooms: replaced the doors, added some dining tables and included a phone in each room. Added a check-in table at the ground floor of the main building. This is a colourful version of the Bates Motel, while the Retroville one was completely B&W. Added a nice thumbnail, so to better locate it in the lot bin; and added lot description in English and Italian. Added a (currently empty) basement: a scary house like that *must* have a dark basement! Otherwise, where could Norman Bates keep her mother? I left the basement purposely empty, so that you can set it up according to your EPs: it would be perfect, for example, for a vampire hotel room (you need to replace the door); or you could decorate it according to the movie, including Mrs. Bates' corpse sitting on the chair! 1) You must download the file BatesMotel_(BV-version).zip in any case: it contains the lot (without any extra content). The zip contains a Sims2pack that you can easily install using either the Clean Installer or the Maxis installer. 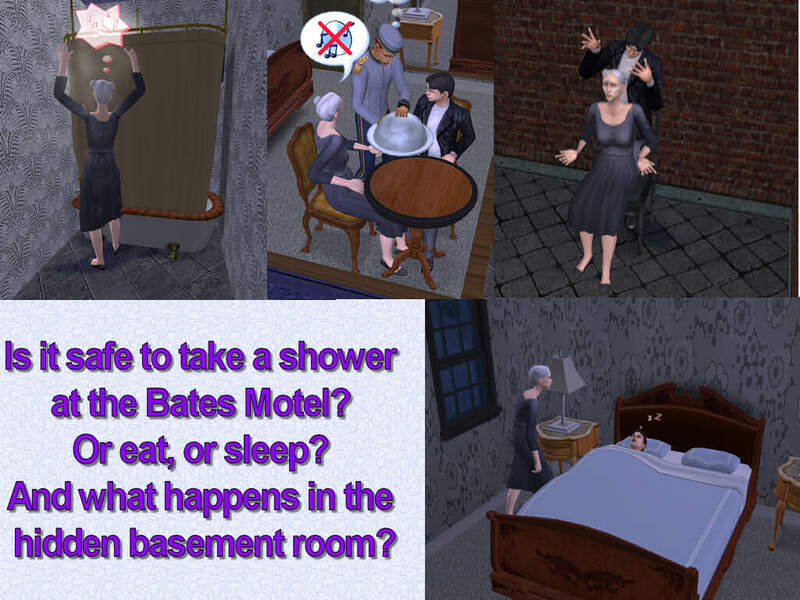 2) You should also download the file BatesMotel_RetrovilleContent.zip, that contains the custom content needed by the Bates Motel; extract the files from the zip and put them in your Downloads folder. NOTE - If you already have the Retroville version of the Bates Motel, then you don't need to download the file BatesMotel_RetrovilleContent.zip, because it contains the very same packages (only the required ones) already released with the Retroville version. This lot is a hotel and therefore Bon Voyage is strictly required. In addition to BV, any other EP is welcome (I created it in a "OnlyBV" game created with the AGS, so the lot doesn't require anything but BV). All credits go to THE MOD SQUAD for the lot and the custom content, except the small additions by me as listed above. You can redistribute this material with proper credits as long as NOTHING from this set or recolors of new meshes from this set go on to any PAY SITES....This set was presented free and it shall always be free, as should all recolors of any items as well. Wow! Thats awesome, cool update! I love the Bates Motel, so this is really cool! Great job as always Numenor! Thanks! This is great, thanks so much. Awesome job. This is Fabulous...my sims are so anxious to try to sleep there!! lol...thanks very much! Very pittoresque and not to luxurious, Thanks for adding some color! #8 31st May 2008 at 9:37 AM Last edited by d4nny : 31st May 2008 at 10:41 AM. I love this the roof is amazing with the tiles, the boolpropping must have taken you ages! Also how did you get that window on there? i like the atmosphere the hotel creates, very eery, awesome job ! It will be a very special destination to visit. Molte grazie Numenor (a lot of thanks) !!! This is awesome! I can't wait to have my sims stay here on vacation! I have friends, oh, but not today...cause they done washed away... they done washed away. Didadragonfly - We meet again Nice to see you here at MTS2! D4nny - You might find it difficult to believe, but I purposely chose that "default" colour for the beddings I wanted them to be as... saddening as possible, and that recolour is definitely saddening! As for the bird's eye pictures, the button to swich to top-down view is only available in build mode (therefore, with the grid lines visible); I had a camera hack that allowed me to simulate the top-down view using the 1st person camera (usable even in "..." mode), but it doesn't work any more with SSN and up. Mihura - Prego (you're welcome) !!! Lauralaima - You guessed right BTW, that window, if the user looks at it carefully, is clearly detached from the roof But there is no way to actually attach a window to a roof like that The original Retroville version had that window placed even further from the roof, I've moved it as near as possible. Thanks, I really like it. Freakin' great job! hehehehehehehehehehehe............. Bates Motel........................ evilness.............. hehe.......... ok im not evil, but great job! i compared it 2 the real one, and its awesome! Did a great job Numenor. Thanks fo sharring. Thanks! You'd make Alfred proud! "Life is a tightrope walker who eventually has to fall. Life is a racer rife with anger and time is a wall." -Martin Clement, in "The Swirls of Time"